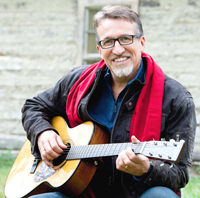 Music breaks open hard ground, preparing it for a seed to be planted, says the Canadian singer-songwriter and Christian musician. Steve Bell, a noted Christian singer-songwriter, leaves it to others to parse the theological implications of his art. Music, Bell said, gets into and loosens hard, packed soil, preparing it for a seed. Beauty, phrases and rhythm are “gardening tools” that prepare soil for planting. Beginning with his first solo release in 1989, “Comfort My People,” Bell, a native of Canada, has released 17 CDs and three concert videos. He has performed some 2,000 concerts across Canada, the U.S., India, Thailand, the Philippines, Poland, Bulgaria, Ireland and the Caribbean. Bell was at Duke Divinity School earlier this year as one of the featured speakers for The Word Made Fresh, a conference on the arts, discipleship and Christian imagination sponsored by Duke Initiatives in Theology and the Arts. While at Duke, he spoke with Faith & Leadership. The following is an edited transcript. Q: Tell us about your background, your major influences. My father is a Baptist minister and served in Alberta when I was growing up. He became a prison chaplain when I was about 7 or 8 and spent the rest of his career doing that. My major church experiences were in a prison. That’s where I grew up, in this raw faith environment, rough but wonderful. It was spectacular. My mom has suffered her whole life with bouts of depression and anxiety. When I was a kid, the church, at least outside the prison, didn’t have a catcher’s mitt for that kind of woundedness. It was very formational for me. It was, in a strange way, a safe place to be as a family. It was a faith environment that made sense and was believable. When I left home and had to find my way as a person of faith, it was hard for me to find a church. I would sit in the back, and nothing connected. It was too tidy. It wasn’t that I was cynical or anything, but it just seemed to be completely divorced from anybody’s real story. Q: I guess there’s no pretense about brokenness when you’re in prison. No, there really isn’t. The outward markers are these brutal tattoos that were done at home. They’re not nice or pretty or fashionable. They betray internal turmoil and brokenness. Yet it was prison inmates that took me in as a boy and taught me to play guitar. They’d have jam sessions on Saturday afternoons, and when I was 8, 9, 10, 11 years old, I’d sit with them. I love saying it, but I’ve recorded 17 albums and done about 2,000 concerts around the world in part because Canada’s most unwanted men took me into their circle when I was a boy. Q: You’re known for your storytelling and your songwriting. What’s the relationship between the two? The stories are always evolving in terms of mining them for meaning. And it reanimates the song, for me at least, in a new way each time. It’s an interesting ministry. It’s not very deliberate, what I do. I don’t have a particular theological agenda or a goal for my audiences. I’m not an evangelist in any traditional understanding of that word. I just sort of feel it’s my job to go and tell my stories and sing my songs and go home, and whatever happens is none of my business in terms of the people out there. Q: I read an interview where you said that songwriting is like “clipping a bonsai tree.” What do you mean? Remember “The Karate Kid”? The old master is teaching the young kid about bonsai. You step back, you think, and you look. Then you come in, and you take off a leaf or just an end or a whole branch. And you fashion this thing. A lot of people now in songwriting, it’s almost fashionable just to throw something out there. It doesn’t matter if your guitar’s in tune or there’s a rhyme scheme. It’s about “being real.” Even in the studio, there’s almost a trend of ugly recording because we want to keep it real. It reminds me of the manicured bed-head look, with guys that always look like they just rolled out of bed but you know it took $500 of hair product to look like that. I’ve always loved thoughtful crafts. I’ll write a song, but I’ll endlessly edit it until it’s recorded, and then I consider it done. It’s always about coming back and just dropping a syllable, adding a syllable, little things, until that unrefined, sort of natural wild growth becomes a thing of crafted beauty. Q: What, for you, is the role of Christian theology in art and music? That’s hard to answer. I’m not that thoughtful about what I do or why I do it. I just kind of do it. I’m here working with Malcolm Guite and Jeremy Begbie. They have seriously thought about not only what they do and why they do it but how it works. Begbie understands how music works, theologically and otherwise. And he’s thought that through, and he can write and he can speak about that. I’d have no idea. I just know that when I sing and I play, things happen for folks that I can’t really control. They seem to be good for the most part, but I do see that there’s a tilling of soil. Music has a way of going into hard, packed soil. It loosens it and prepares it for a seed that wouldn’t otherwise be. So I see a lot of beauty, phrases, rhythm. These things are all gardening tools to prepare soil for something that someone else is going to drop in there. That’s how I see what I do. Also, my stories are very particular about “this happened” and “this happened” and “this happened.” But in the songs I sing, none of that is in the song. What I try to do is mine my own story for meaning, sing the song, and then get out of the way. Our lives are meaningful, but not necessarily dramatic. A lot of the great meaning doesn’t come out of the dramas. It just comes out of attending quietly and patiently. My work has been, to some degree, learning how to do that with my own life and then doing it publicly. Q: Where does imagination and skill come into play in songwriting? I just came from a lecture with Malcolm Guite, and he’s all about theology through the imagination. When you think about it, anything that we know starts with the imagination. Imagination got reduced behind reason a few hundred years ago. It’s not that reason is bad -- it’s something that we need, to know anything. But anything we know reasonably started because someone apprehended something they had no words for. And the minute you put words to it, you by nature have reduced it. So there needs to be some humility to all of our equations, you know? We’re not out there to decimate ignorance with our equations. We’re there, through the imaginative capacity, to really start to see that behind this flower or this vase or this table is a deeper reality that there really are no words for. I might be able to write a poem or sing a melody that gives you a hook into that deeper reality. So much of Christian theology and the arts, especially music, has been didactic. It’s been taking some big concept and bringing it down to a point that’s saying, “This is what you should know, and this is the answer,” rather than being more iconic, like icons -- a small point opening up to a wide point. Instead, we’ve done the opposite. The Enlightenment did that. It was putting a point on things rather than opening people up to a vast vista. How do I take that mystery that I can sense in my bones? I know it’s there. I don’t have any words for it. But I need to reduce it to some door, something I can locate, something I can show you -- either give you or get you to listen to. It’s particular and it’s small, but it’s a door. It’s not an endpoint. That’s the work of the imagination. How do I take that big thing out there and reduce it to a set of lines or set of melodies that will woo you to the possibility of the mystery? But if I let you go through that door, I actually have to let you go through the door. What you find on the other end, I can’t control. So it’s also about, to some degree, letting go of the outcomes. Modern theology is all about controlling outcomes. We’ve been really afraid of the artist or we’ve been afraid of the rebel, because what if they’re wrong, what if our children get taken, all of that. I understand that. I’ve got kids, so I get the fear and the vulnerability. But in the end, I need my imagination to apprehend what there are no words for, to come up with some kind of reduction that’s an alluring door that’s actually open-able and then let it go. And then the making of that door is the skill. It needs to be done well. The medium, to some degree, has to be the message. If I’ve apprehended some beauty, some excellence out there, the doorway has to, in some way, be a true wooing. Otherwise, I’m just manipulating you or lying to get you to do something else. It has to somehow reflect, so that’s where your craft has to come in. Q: What role does liturgy and tradition play in your music? Huge. When my dad started working in the prison, he made good friends with the Catholic priest. They often did joint services together. And I was introduced to liturgical worship. I remember just the thrill of it. There were always these moments that week after week would thrill my soul. I didn’t know why, but my heart would just sing at this moment or that phrase, but I had no idea why. And I think, to some degree, those were those doorways that were opening up to a possibility that I didn’t know was out there. They were truly icons, those moments. I felt there was a big world on the other side of that door, and every Sunday, at these different moments, that door would open and you could peek through. Now, being a little Baptist boy, I wouldn’t have walked through. But I would peek through. I remember that very clearly. The Catholic priest also served as the parish priest in town, and they had no music. My mom and my sisters and I ended up being the worship band at the Catholic church. Week after week, I sat there in the liturgy and bathed in it, soaked it in. It became part of my consciousness. When I got on my own, I would find myself drifting into Catholic church some, especially midnight masses and folk masses, sitting at the back. My eyes would close, and I’d feel the nourishment somehow without having any words for it. I think it’s because, in essence, it’s art. Liturgy is art. Even with Scripture, I started apprehending Scripture as being art, not a document. It’s meant to be art. Q: Does liturgy influence your approach to music? It does. If you look at the whole body of my music, you’ll see lots of songs that are very informed by or for liturgy and worship. It shows up in a sacramental worldview, in the notion that experience itself is sacramental. It’s always pointed to something beyond it. What it does is, it transforms my everyday experience. It changes my whole worldview to the point now where there’s not a moment that comes to me that I don’t believe is gift. That’s what the contemplative work is. It’s to attend to the situation, attend to the moment, fully expecting that there’s gift in it that you need to be grateful for but also humbly accept, because you need it, because you are fundamentally, by definition, needy. It just changes all of life’s experiences. So that plays deeply into my songwriting, which is why, if you look at my songwriting, you’ll sense agony and pain and all of that, and life’s struggle. But you’re not going to get a lot of really dark songs, because in the end, I fundamentally don’t believe it’s dark out there. I don’t believe it. I think it’s bright out there. That puts me at odds with the culture, because right now it’s so hip to be dark. Not for a moment do I believe that there isn’t darkness out there. I’m not naive. I just don’t believe it’s the last word.